Why do we do impact assessment? In three words: for better decisions! I passionately believe that environmental assessment should be a proactive agent in positive development, not just a regulatory hurdle. The main motivator for carrying out impact assessment should be better designed projects, not just compliance with the law. It is interesting to look to the past, before impact assessment became a formalised process around the world, and to find out about good environmental decisions that were done before impact assessment. The story I would like to share with you is from 1965. It is the case of the planned Edinburgh city centre motorway that would have destroyed part of this historic city and that came so close to being approved. The story of the five or so people who helped stop this project is not well known, even to people who live in the city of Edinburgh. I have a personal connection to this story, as my father-in-law, Professor Alan Thompson, was one of these five people. Edinburgh is the capital city of Scotland. The city has over 4,500 listed buildings and is world-renowned for its rich architectural heritage. The medieval architecture of the Old Town, together with the neoclassical terraces of the New Town dating back to the 18th century, give Edinburgh a unique character. So much so that, together, the Old and New Towns were listed as a UNESCO World Heritage Site in 1995. In the 1960s, however, people were worried about traffic congestion, particularly when they had forecast that car ownership would double by 1990. Planners at the time claimed that the only solution was to build more and more roads. In other European cities, bomb damage during WWII had provided corridors for the new roads. Edinburgh, luckily, was relatively unscathed by bomb damage and therefore the only way to make way for new roads in the middle of the centre was to demolish existing buildings. The ambitious plan was to build an enormous motorway through the historic heart of Edinburgh. Called the Buchanan Plan of 1965 (the main author was Colin Buchanan, at the time a keen motorway planner and interestingly one of the first city planners to suggest congestion charges to reduce traffic in cities), it would have been an eight-lane motorway (later scaled down to a modest six lanes) right through the New Town, under Calton Hill and through the Royal Mile. This would have irrevocably altered Edinburgh forever (as can be seen on the drawing below showing what the motorway would have looked like). The route under the Royal Mile was the most controversial. It would have resulted in the knocking down of two 100-metre stretches of the historic old town. Not surprisingly, there was vocal opposition to the proposed new Edinburgh motorway. What is more surprising is how small the main pressure group was, with only five main people or so. This articulate pressure group started a campaign called the Edinburgh Amenity and Transport Association. They lobbied councilors and wrote letters to The Scotsman newspaper to show what devastation would be caused and to make the public aware of what was going on. The campaign was on a relatively small scale, but they managed to persuade just enough people on the council to stop it. When the plan came to a council vote, it was rejected by the incredibly narrow margin of two votes. Eventually, after years of lobbying and campaigning, the plans for the Royal Mile section were finally shelved in the early 1980s. Instead, the Edinburgh City Bypass that skirts the southern fringes of the city was constructed between 1981 and 1990. 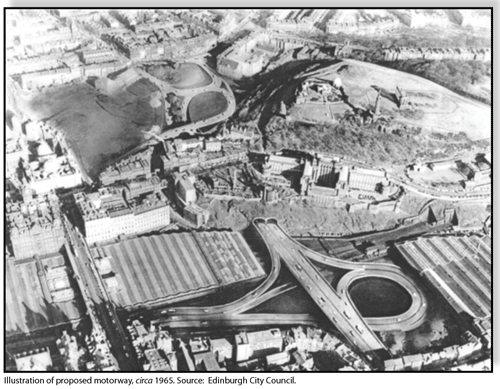 It is unlikely that Edinburgh would have been made a World Heritage Site in 1995 if the motorway had gone ahead. This not-well-known real story is a lesson to us all, of how Edinburgh came so close to having a motorway running through its historic centre and how, before email and social media, a small articulate pressure group managed in the 1960s and 1970s to change the outcome of a very detrimental project mainly based on letters and newspaper articles. 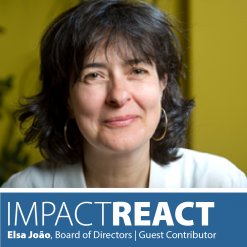 Dr. Elsa João is the Director of the MSc in Environmental Entrepreneurship in the Department of Civil and Environmental Engineering at the University of Strathclyde in Scotland and currently serves as Member of the IAIA Board of Directors.